Also known as Hydrangea anomala, the climbing hydrangea is a large, showy vine native to Japan and China. Growing vertically, it can reach heights of up to 60 ft (18m). Hardy to zone four, this easy-care vine is well-suited to nearly any planting site, and with time and patience will become a truly spectacular addition to any home or garden. The climbing hydrangea is a woody, deciduous climbing vine that attaches to walls and fences using rootlike structures known as holdfasts. This vine is slow to become established, the first few seasons of growth being marked by a slow, steady upward progress. At first, you may fear your new garden addition is doomed to a future of umremarkable mediocrity, but rest assured this is not the case. Flowers generally do not appear for the first two to four years of growth, and the vine itself remains undistinct during this time. Only after the third or fourth year does this hydrangea really begin to show its full potential. When mature, this is a fully three-dimensional garden feature, more closely resembling a vertical bush than a simple vine. The flowers are small and white, with three to five delicate sepals on each blossom. Taken individually, these hydrangea blossoms lack impact, but the sheer profusion of flowers make the climbing hydrangea a stunning showpiece in the garden. The fragrant blossoms grow in clusters known as corymbs, with each corymb reaching six to ten inches (15-25 cm) across. Corymbs occur all over the vine, covering the support structure in a shower of sweetly perfumed blooms. In zones seven and higher, the snowy white adornments appear in early May and persist until late fall, at which time they gradually fade to papery brown. 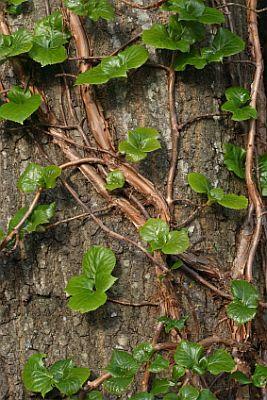 The climbing hydrangea will thrive in nearly any locale. Sun requirements are modest, and most plants will flourish in light levels ranging from full sun to full shade. In very warm climates, plant on the North or East side of a structure to shelter the vine from sun damage during the hottest part of the day. If planting on a trellis, choose the support structure for strength rather than aesthetic appeal. Once your hydrangea is mature, the underlying support will be hidden under the dense foliage, but the weight of the vine may soon overwhelm all but the sturdiest trellises. Choose a location where the vine has good support and will not be disturbed during the vulnerable early years. Dig a hole equal to the depth of the hydrangea's container and twice as wide. Add some organic matter such as peat moss, and some bone meal to encourage root formation. Place the root ball in the hole, gently spreading out any fibrous roots to comfortably inhabit the available space. Fill in the remainder of the space with good topsoil and gently firm the soil down around the base of the vine. This beautiful, impressive vine is among the most adaptable of the climbing vines and requires only basic care once established. For the first year or two, keep the soil moist and fertilize lightly. Early growth is slow and as a result, nutrient requirements are modest. A mature hydrangea will mostly fend for itself, so an annual top-dressing of compost or aged manure is usually sufficient to keep your hydrangea looking its best. Mirranda: A fairly new cultivar, this variety boasts strikingly variegated leaves, with dark green centers and yellow margins. Early Light: Another variegated variety, Early Light has white margins on new leaves only, creating a lovely contrast with the dark green, mature foliage as a background. Firefly: Leaf margins are yellow in early spring, deepening to chartreuse as the growing season progresses. Moonlight: Another specialty cultivar, Moonlight has sterile sepals larger and showier than those of most climbing hydrangeas. A climbing hydrangea is a long-term time investment. If you are looking for a vine to cover a structure in a single growing season, other vines are better suited to the purpose. If, however, you are willing to wait a little while to enjoy a sturdy, impressive and classic beauty, you cannot go wrong with a climbing hydrangea.